TeamSpeak 2 is a quality, scalable application which enables people to speak with one another over the Internet. Teamspeak consists of both client and server software. The Teamspeak server acts as a host to multiple client connections, capable of handling literally thousands of simultaneous users. 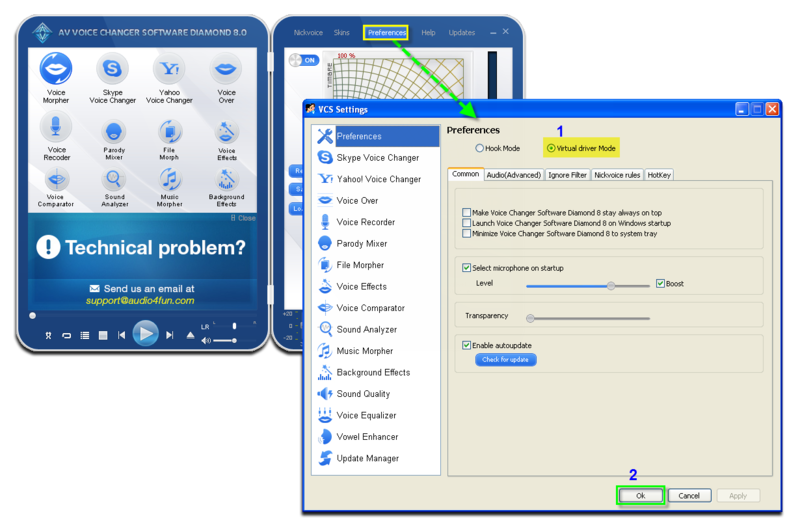 In this tutorial, we demonstrate how to use the Voice Changer Software Diamond 8.0 for changing your voice in TeamSpeak 2 application. Click the OK button (2) to apply the new settings and close this window. Click Settings » Options to open TeamSpeak's Settings dialog box. In the Settings dialog box, choose Sound Devices (1). 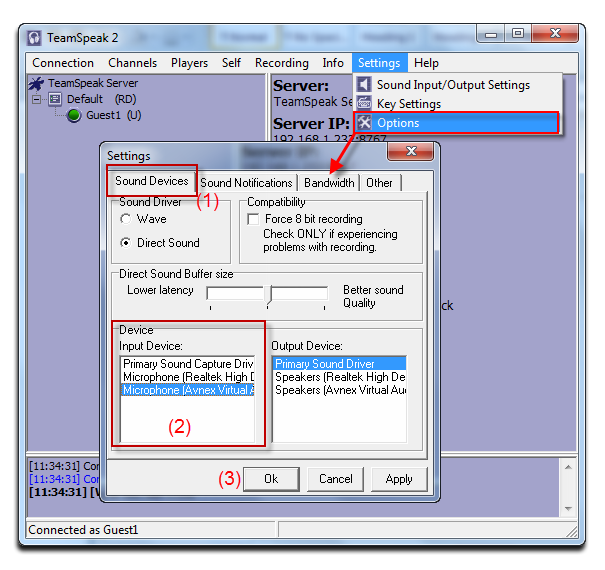 In the Device section, choose Avnex Virtual Audio Device for Input device (2). From now on, VCS Virtual Audio Driver will be the main audio driver used on TeamSpeak. Return to VCSD7, choose the morphing effects for your voice, and make adjustments until you are satisfied with the output voice. Note: You should have known how to change voice using Voice Morpher feature. Note: While VCS Virtual Audio Driver is being set as the audio driver for TeamSpeak 2, DO NOT turn off VCS8 when doing voice chat with TeamSpeak 2. If you don't want to use VCSD8, change the audio settings of TeamSpeak 2 back to normal audio device.